Ralph David Abernathy was born on March 11, 1926 in Linden, Alabama. His boyhood was spent on his father’s Alabama farm but he joined the U.S. Army and served in World War II from 1941 to 1945. After his service Abernathy returned to his home state where he attended Alabama State College in Montgomery, Alabama, receiving a degree in Mathematics in 1950. During his years at Alabama State College, he became involved in protest activities. He led demonstrations protesting the lack of heat and hot water in his dormitory and the inferior food served by the college cafeteria. Abernathy also became a Baptist minister in 1948 while still in college. Abernathy attended Atlanta University, where he earned his M.A. degree in 1951. That same year he became pastor of the First Baptist Church in Montgomery, Alabama, the largest African American church in the city. It was this pastoral post that eventually propelled him into the civil rights movement. Rosa Parks’s refusal to sit at the back of a segregated city bus on December 1, 1955 sparked the Montgomery Bus Boycott. Rev. Ralph Abernathy soon joined Rev. Martin Luther King, Jr., the pastor of the Dexter Avenue Baptist Church in Montgomery, in the protest. Both men became leaders of the effort and founders of the Montgomery Improvement Association which was the coordinating arm of the boycott. In 1957 King, Abernathy and other Southern black ministers created the Southern Christian Leadership Conference (SCLC) in Atlanta, Georgia to continue the civil rights activism that began with the Montgomery Bus Boycott. King was selected as SCLC’s first president and Abernathy became secretary treasurer of the organization. In 1961 Rev. Ralph Abernathy became the pastor of the West Hunter Street Baptist Church in Atlanta. From this new pastoral post he led the Albany Movement with Dr. Martin Luther King that year. For nearly a decade Rev. Abernathy was involved in every civil rights campaign launched by Dr. King. After the assassination of Dr. King in 1968, Rev. Abernathy immediately became President of SCLC and continued to lead the protests in that city in support of striking sanitation workers. He also vowed to continue Dr. King’s Poor People’s Campaign and led the campaign’s demonstrations in Washington, D.C. in the summer of 1968 and the Charleston Sanitation Workers Strike in 1969. The Poor People’s Campaign failed partly because Abernathy lacked the charisma of his friend, Martin Luther King, and partly because the nation’s mood was much more conservative on civil rights issues. Rev. Ralph Abernathy continued to lead SCLC until growing tensions over the direction of the organization forced to his resignation in 1977. Later that year he ran unsuccessfully for Congress. Three years later Abernathy became the most prominent civil rights leader to endorse Ronald Reagan for President. After 1977 Rev. Abernathy returned to his pastoral duties at West Hunter Avenue Baptist Church in Atlanta, a post he held until his death. In 1989 he published his autobiography, The Walls Came Tumbling Down. Rev. Ralph David Abernathy died of cardiac arrest on April 17, 1990 in Atlanta, Georgia. 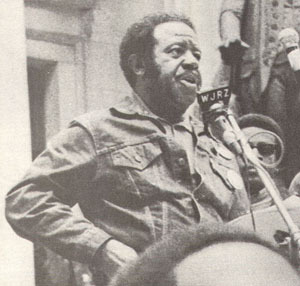 Ralph David Abernathy, And the Walls Came Tumbling Down: An Autobiography (New York: Harper and Row, 1989); http://www.georgiaencyclopedia.org/nge/Article.jsp?id=h-2736.